Tamil nadu is known for its ancient cultural heritage. Tamils all over the world ar proud of the culture of Tamil Nadu and take great efforts to safegaurd and practise their cultural traits. A distinct ethnic group with a history dating back to Sangam era (from 400-300 B.C.E to 300 CE), Tamils are either Saivites or Vaishnavites segment of Hindu pantheism. Their literature can be traced to the grammatical treatise 'Tolkaapiyam' written around 500 B.C. While a majority of Tamils are Hindus (88%), Christians forming 6% of the population and Muslims (5.57%) live in harmony and have their own places of worship and festivals to celebrate. Lord Muruga is the chief deity of Tamils and its six abodes are pilgrims centres located in different parts of the state. During the reign of Cholas, Cheras and Pandyas, a number of temples and public utilities like dams and irrigation tanks were built which are still being used after minor renovation. Temple architecture showcases the Dravidian style the hallmark of which is towering gopurams (temple towers) in which statues of gods and goddesses are engraved with a range of filigree works sculpted all over the towering edifice. In fact the architecture in Meenakshi Amman temple (Madurai), Brihadeeswarar temple (Thanjavur) and in countless others that dot the TN landscape narrates the grand legacy of Tamils who have a cultural history drawing mainly from Hindu scriptures and mythological anecdotes. 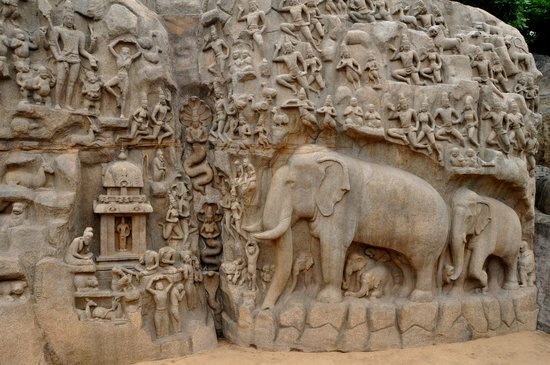 While temples are replete with giant marvels in sculptural works and aesthetic carvings, there are monuments like at Mamallapuram seashore resort that just give one a glimpse of the construction ability of Pallava rulers who were known for their seafaring ability and also patronised fine arts and crafts during their reign. One of the ancient literary treatises Tolkaapiyam written during Sangam era (400 BCE to 300 CE) has laid down the grammar of Tamil, the mother of all Dravidian languages, that is compared to Sanskrit of the north, Latin and Greek of the European civilisation. While Thirukkural penned by Tamil savant Thiruvalluvar (1 or 2 Century CE) has in pithy sentences given an encyclopaedic formula for ethical living to ancient Tamils, there are a number of classical literature like Silapathikaaram and Manimegalai that have expatiated on the rich traditions of this ethnic community. In the modern world, Tamil language is considered one of the classical languages of the world, but unlike Sanskrit, Greek or Latin, this lingua franca is thriving with ever expanding usage and addition of words, phrases from other languages. Some even believe that this dravidian language is older than sanskrit. 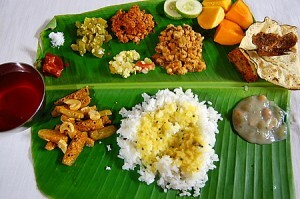 Eating well-prepared three-course meal is part of the ancient tradition of Tamils. While food is spicy and is peppered with a number of powdered ingredients to make it nutritious and healthy, Tamils rejoice taking a well-structured menu with vegetables, cereals and a good amount of sambar (or kozhumbhu) to go with the white, grainy rice. Of course in tiffin items, none can beat the combination of idli, dosa, chutney and vada, all of which typifies as the 'Madrasi food' to the people from north India. Womenfolk are respected in households as they are supposed to bring in wealth in the form of Goddess Lakshmi. But in very orthodox families, especially Brahmins, a widow is always shunned and deprived of all customary and hereditary rights. With a number of social changes and women attaining financial independence, strict dos and don'ts are fading away and being replaced by libertarian views and progressive attitudes. In rural Tamil Nadu, there are pockets where female infanticide is still prevalent as villagers think that girl children are a burden to them as they have to fork out huge money during their marriages. If Tamil Nadu is at the forefront of software industry, it is mainly due to the emphasis placed on education in the families here. Every child is inculcated with the value of education and that too a high ranking degree in a prestigious university (if it is foreign, it is much better) which will fetch him or her lucrative career to ensure financial luxury and of course, an opulent lifestyle. 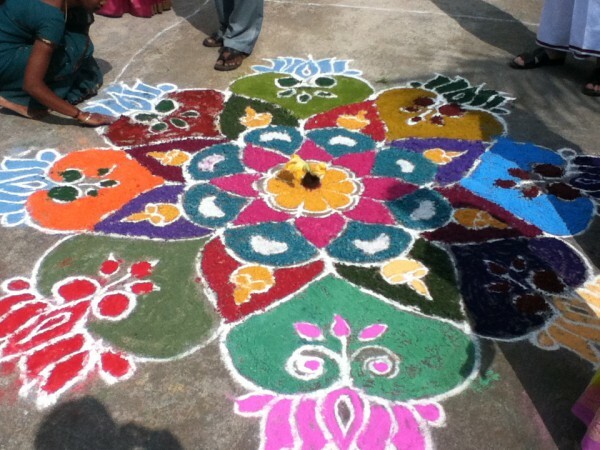 Even in urban centres, one can note that houses sport colourful kolams at the stroke of dawn in Tamil Nadu and in tamil homes across the globe. Usually, the leading lady of the house ventures out early in the morning to draw kolams which have to be done before the sunrise. With growing tasks of a wife, where she is sending children to school and getting ready to go to work, house maids are now often left with the task of putting the Kolam. 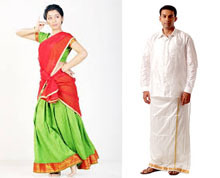 Veshtis and silk sarees (Pattu Saree) during festivals are the distinct trademark clothing of Tamil couples. The traditional dress of tamil nadu unmarried girls is the 'Half Saree', which is increasingly used only in festivals as the blouse and long skirt with duppatta has been replaced by the north Indian Salwaar Kameez just as the 'Pavadai' (blouse and skirt) for little girls is replaced by frocks and trousers and tshirts. While men have vibhuti (along with sandal paste sometimes) on their forehead, kum kum or any other bridal decorations to suit the occasions are seen on women's forehead. Tamil Nadu women often adorn themselves with flowers in their hair, the favourite being 'Malli Poo' or jasmine. Sadly the malli poo also seems to be going out of fashion. Gold is well loved for ornaments for men and women and most tamil folk can be seen in some gold ornaments like big finger rings and thick neck chains. Diamonds and other stones have been another favourite in their jwelry. The harvest festival Pongal (January 14-15) is celebrated with much pomp and grandeur throughout the state as it is the 'money back' time for farmers who harvest the paddy and sell it in the market. Moreover, state government declares nearly a 5-day holiday during this time and the people spend most of the time with their families and going out with them for social interaction too. National festival Deepavali celebrated over the slaying of demon king Narakasura by Lord Krishna is also one of the most joyous occasions for the Tamils. Crackers, sweets and new clothes are important things that cannot be missed in any family during this festival. While singing comes naturally to the people here, Tamil language is flexible enough to accommodate the growth of a number of dialects which have their own music genre evolved over centuries. However, when it comes to the music for the elite group, the Carnatic music that evolved during later half of 18th and early 19th centuries have been known to entertain a refined audience known for their acute sensibilities and knowledge of the music. But for the masses who could not decipher the intricacies of the Carnatic music, popular numbers having common lyrics snatched from the popular usage hold sway and form an important medium of entertainment. 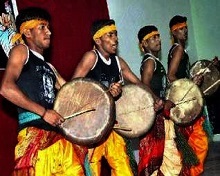 Rich in diversity, the states boasts of a variety of folk dances like Parai, Karakaatam, Villupaatu and Koothu that add spice to the life of local inhabitants including tribes in hill areas. 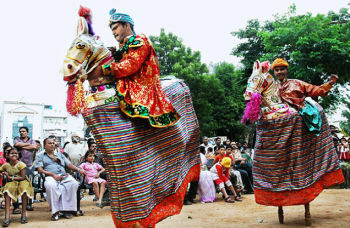 These traditional arts practised by a location-specific group have been the source of livelihood for many who perform them during temple festivals or on any grand occasions. 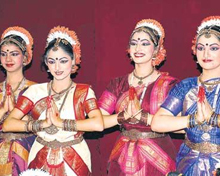 Bharatanatyam is the officially recognised classical dance form of Tamil Nadu. The dance requires intense training to master its gentle movements, subtle poses and flexible gestures (of senses and body) even as many exponents like Padma Subrahmanyam have used this medium to become cultural ambassadors of the state in foreign countries. 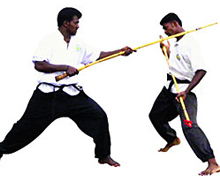 Known for their chivalry and fortitude to face hardships, Tamils have evolved a self-defence technique called 'Silambam' that involves fighting with a long bamboo stick. This art form needs agile footwork in tandem with the swirling of the stick to defend against personal attack. In villages, it is not uncommon to see groups of youths getting trained in silambam as part of their daily exercise as this art form keeps them fit by keeping their muscles strong and taut.